1 Gnostic(a), adj. Also, gnostical. 1. pertaining to knowledge. 2 Geomorphic, adj. 1. of or pertaining to the figure of the earth, or the forms of its surface, 2. resembling the earth in form. 3 Guano, n., pl. ~nos. 1. a natural manure composed chiefly of the excrement of seabirds, 2. any similar substance, as an artificial fertiliser made from fish. 4 Gregarious, adj. 1. living in flocks or herds, as animals, 2. Bot. growing in open clusters; not matted together. 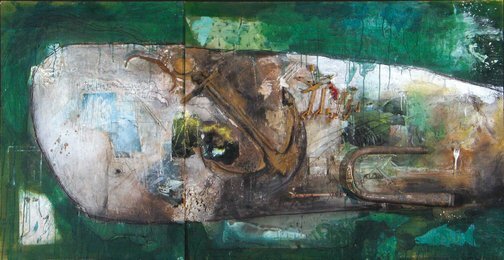 James Algie’s painting references the allegory of Jonah and the whale from the Bible. His work demonstrates the ability to respond to history and culture in a visual form. Examine the impact of culture and society on artists’ practice. Is it present in the way marks are made or the materials used? Consider the relevance of these elements when interpreting the visual language of an artwork. 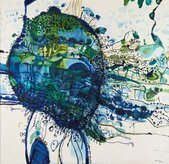 Research the narratives that John Olsen and James Algie have based their works on. Discuss how each artist explored their subject matter. Outline how each artist has captured a narrative in a single image. Consider the expressive qualities of each work focusing on the artists’ subjective response to their subject matter and materials.